Confused already? I will do my best to make this post understandable my the least technologically advanced person at your business. Let's start with the absolute basics. URL stands for uniform resource locator. It allows your web browser to know what file to show. Think of it as the address for your office. If you want a prospective customer to find you that has never been there, you have to give them some sort of address for them to get there. To keep it simple, URLs do that same thing for browsers, they just point to files that live on servers instead of a physical address. The URL for our website is http://www.protocol80.com. The URL contains the domain name that you have purchased from GoDaddy or Network solutions. As a SMB what else do you need to know? To be simplistic, URL hierarchy allows you to access pages further into your website. Take a look at this sample URL: http://www.YourWebsite.com/Products/New-Products.aspx. This points to a file called New-Products.aspx that lives in a folder called Products that lives in the root folder of YourWebsite.com. Easy enough? It's the same as when you are looking through files on your computer. What happens when you get a little more complex? Let's look at http://www.YourWebsite.com/Products/Used.aspx?Guid=b6a3-efs8-4af. The end of that url (Guid=b6a3-efs8-4af) probably means nothing to you. It does mean something on the web. It is a unique identifier that points to a specific product within a database. So what? You probably have a hard time comparing yourself to a search engine, but they have the same issue as you. A search engine has no idea what GUID=dfsj-fdas-342vf4 is so they cannot translate it to that specific product. A search engine relies on text that correlates what people search with to show relevant results. If you are using Shiny-Blue-Widgets in your URL, in the product name, in the page title and wherever else is relevant, a search engine can better understand what it is looking at, therefore more likely to rank the site within the search engine results page. Generally I like to provide tips that you can do yourself...unfortunately this is one you probably can't handle. Sorry folks. You may be thinking to yourself, why even use a unique identifier. Well, databases can be complicated. The URL has to point to a specific record within a database. In order to do it without snag, it must be unique. Think of it like a person's social security number. There are several people named John Smith, but none of their social security numbers are the same. Obviously there is a little more to it than a couple of paragraphs, but this is what you should understand. Bring it up next time you talk to your developer. 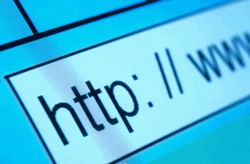 Think you have an opportunity to improve your website with URL rewriting, we would be happy to help.